A homeowner came in to my office today to list his home for sale. We discussed a recent news article that both of us had read that prices were up but that the number of closed sales were down. We discussed the lack of homes for sale in our real estate market as the probable cause of both the higher prices and the lower number of closed sales. When you have 3 or more buyers making offers on the same house, it stands to reason that the number of closings would go down because only one of the buyers got the home. The other buyers are still looking for their own home and will probably enter another multiple offer situation when the next home comes on the market. Success in buying comes at a cost of patience. Some buyers end up making offers on 2 or 3 homes before they come out on top. It is possible that they may have to offer above list price to get their home. Home prices are still at bargain levels even if a buyer pays more than list price to win. With the low interest rates that still exist, monthly payments can still be very affordable. For a list of homes for sale including foreclosures and short sales and other bargain priced homes, call the Naisbitt-Bagley Team at 435-865-1019 or email naisbitt@inxsnet.com or text Janet’s mobile at 435-559-7772 at ERA Realty Center in Cedar City, UT. The Naisbitt-Bagley Team will work hard to help you make all of your real estate dreams come true whether buying or selling. Recently, one of our buyers that has been searching for the right home for a long time, found their dream home and bought it. This is not the first home for which they had made an offer. Yes, they had lost out on a previous bid to another buyer. That makes their success even more fun for us to share! What fun these happy buyers are experiencing as they begin to move into their beautiful home. What joy! They are thrilled, and so are we! It just doesn’t get any better than the warm glow that comes into your heart when you own your own home. What if we had given up? What if they had given up? No way! Happily, we kept working together while searching and touring homes until their real estate dreams became a reality with an affordable monthly payment. The Naisbitt-Bagley Team would love to use their real estate knowledge, experience, training, service and expertise to help you find your dream home. We have the technology and tools to do just that. Please call 435-865-1019 for details. You can also email naisbitt@infowest.com or text 435-559-7772, Janet’s mobile. Please call The Naisbitt-Bagley Team at 435-865-1019 at ERA Realty Center for your free consultation today whether you want to buy or sell your home. Please remember that we love referrals. Referrals are the cause of our success. Thank you. You and Your REALTOR Both Deserve Loyalty! Your real estate agent works hard to help you succeed in buying your home. It benefits you to have your own agent send you lists of homes that match your criteria and to make sure you get the new listings and price changes as they come on the market. It benefits you to tour the homes for sale. It benefits you to have your agent write your contracts and negotiate on your behalf and then follow up with inspectors, lenders, appraisers, title company and more to make sure the sale closes. When your agent is working hard for you, please be loyal. Your agent devotes time, energy and money to help you succeed. She gets paid only when your sale closes. How would you feel if you spent hours and hours on a job, only to discover that your boss decided to give the last minutes of work to someone else and then pay them for the entire job with no compensation to you? Ouch. That hurts! I believe it is very important to live by the Golden Rule in all of our dealings with our fellow man. Making a win-win situation for all parties with everyone working together should always be the goal. I like to give educated, experienced, loyal top service to all my clients. I am very grateful when my clients and customers appreciate my hard work and stick with me until they walk through the door of their very own home. The greatest joy in my 30-year real estate career is to help my clients get the happy successful real estate results they dream of. Please call the Naisbitt-Bagley Team at ERA Realty Center at 435-865-1019 or email naisbitt@inxsnet.com for help with all your real estate needs. You can also text 435-559-7772. Interest rates have taken a hike upward, but they are still amazingly low! When I passed my real estate exam the end of 1983, rates were approximately 18%. Rates below 5% are a gift to homebuyers! 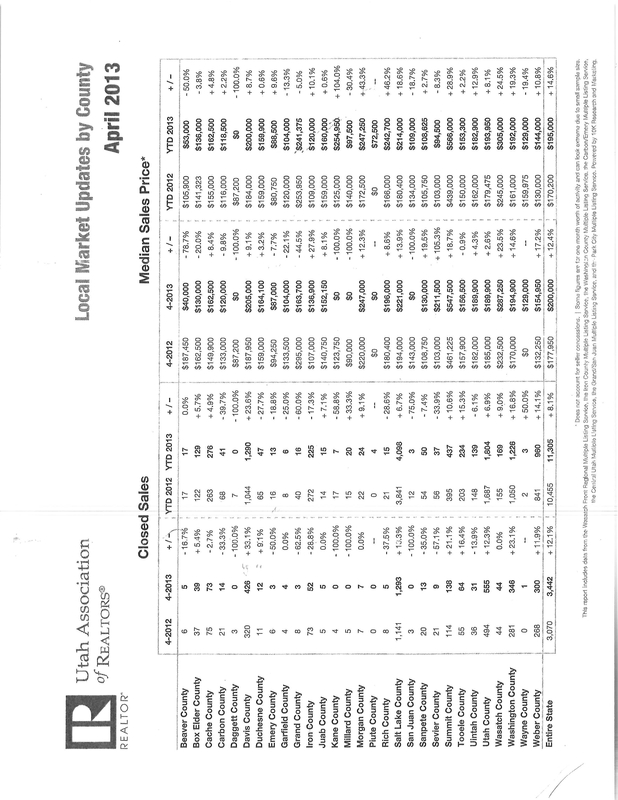 The Utah Association of REALTORS (UAR) Local Market Updates by County for April 2013 are attached. May’s are not out yet, since it takes the UAR approximately 2 months to compile the statistics for every county in Utah. Iron County closed sales were down 17.3% year to date (YTD) as compared to 2012. The Median sales price jumped to $120,000 YTD which is a 10.1% increase. I believe part of the reason for the decrease in sales is because of the decrease in inventory in the lower price ranges. Several buyers often bid on one home and, of course, only one can purchase the home. If there were more homes on the market, there would be more closings. The fast-moving homes for sale are typically in the price range of $150,000 or less where many buyers are outbidding each other for fewer homes. However, homes are selling in all price ranges if they are priced for the market. Prices are still very affordable, but buyers need to move quickly and might need to offer more than list price to get the best homes. We do see investors as well as primary home buyers purchasing homes. Bargain priced lots are attracting buyers and builders are building more homes. With the low prices of lots, builders are able to keep their prices more competitive with the resale market. Larger parcels of land are still a slow sell, and developers are not entering the market as yet. There is a little commercial activity. Please call 435-865-1019 or email naisbitt@inxsnet.com for a free consultation regarding pricing your real estate for the market and making sure your property is in show-perfect condition to attract buyers. Both are key factors along with top marketing. I do not know of anyone that markets more aggressively than the Naisbitt-Bagley Team including on-line marketing worldwide, real estate magazines, having the Chamber of Commerce send our ads to everyone that contacts them and much more. Please call for a copy of our extensive marketing plan. The Cedar City Daily News reported June 7, 2013, “Cedar City Lands Syberjet Project.” “Cedar City—After years of work and negotiations, SyberJet Air-craft announced Thursday the company has chosen Cedar City as the site for its headquarters and the SJ30 private jet assembly facility that could bring approximately 1,200 jobs to Iron County.” Wow! This should have quite the impact on the small town of Cedar City, Utah, as well as the surrounding areas. What exciting news! The Cedar City Daily News reported June 15, 2013, “Cedar City 14th most affordable.” This is pretty impressive news also! “Cedar City—According to a study by the website nerdwallet.com, a consumer advocacy website based in San Francisco, Cedar City is the 14th most affordable city in the United States.” “St. George is ranked 96th.” “Cedar City and St. George are the only Utah cities that made the list.” What could be better than living in our affordable city where most people come to play? There is so much to do including hunting, fishing, the arts, drama, sports, nearby national and state parks, the summer games, the world famous Shakespearean Festival, the 4 year university and much more. If you add the above to the news about the GAF Roofing Company and the new temple being built by the Church of Jesus Christ of Latter Days Saints, I would say Cedar City and surrounding areas have a bright future ahead. At the Business Expo, the representative of the Chamber of Commerce mentioned that they are receiving more requests for information on our area. Most of the Naisbitt-Bagley Team clients are referrals, so please remember to let us know if you know of anyone with real estate needs. Whether buying or selling, we work hard to help you make all of your real estate dreams come true. Please call for your free consultation, problems or concerns today at 435-865-1019 or toll free at 800-934-3742. You can also email naisbitt@inxsnet.com or text 435-559-7772.